Steve Squyres of Cornell University, the rovers' principal investigator, discusses the latest discoveries from Spirit and Opportunity. Editor's note...All times in the following story refer to Earth-received time, i.e., when events are confirmed to have happened, not the actual time an event happens at Saturn. One-way light time from Saturn to Earth currently is about 68 minutes. In a long-awaited milestone, a European-built probe carrying cameras and a suite of scientific instruments was released from NASA's Cassini Saturn orbiter Christmas Eve, setting up a dramatic Jan. 14 plunge into the atmosphere of the ringed planet's mysterious moon Titan. Ejected by springs designed to impart a 7-rpm rotation for stability, the Huygens probe was jettisoned from the Cassini mothership around 10:08 p.m. EST. Flight controllers at the Jet Propulsion Laboratory in Pasadena, Calif., verified a clean separation 16 minutes later. "The short story is the release went absolutely nominally," said Earl Maize, Cassini deputy program manager. "As near as we can tell from all the telemetry we've seen, we've had a perfect separation. The release sequence was executed on board the spacecraft at 7:07 this evening Pacific Standard Time. We were out of radio contact at the time, we expected the release to impart a recoil to the spacecraft and it would take it some minutes to recover radio contact with the Earth. We got back into contact at 7:24 and telemetry soon thereafter verified that all of the events went just as we expected." Data from Cassini showed the main umbilical between the mothership and Huygens was severed as expected, pyrotechnic devices fired as planned and the orbiter recoiled as engineers predicted it would. "So we have every expectation that the release was perfectly nominal," Maize told reporters in an early Christmas Day teleconference. "The radio contact was right on the spot and detailed analysis is in progress." Said Jean-Pierre Lebreton, European Space Agency Huygens project scientist: "I feel very happy. We are now on our way to Titan. It will take 20 days and a big day is in front of us on the 14th of January." 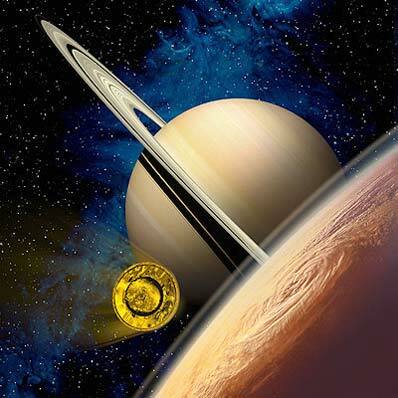 Cassini will attempt to photograph the departing Huygens probe later today to more precisely determine its trajectory. "We wish to congratulate our European partners as their journey begins and wish them well on their descent to Titan," Robert Mitchell, Cassini program manager at the Jet Propulsion Laboratory in Pasadena, Calif., said earlier in a statement. "We are very excited to see the probe off and to have accomplished this part of our job. Now we're ready to finish our part - receiving and relaying the Huygens data back to Earth." If all goes well, the flying saucer-shaped Huygens will slam into Titan's hydrocarbon-rich atmosphere around 5:13 a.m. Jan. 14 at a velocity of some 12,400 mph. Descending through the moon's smoggy atmosphere under parachutes, Huygens will finally reach the surface some two-and-a-half hours after atmospheric entry. 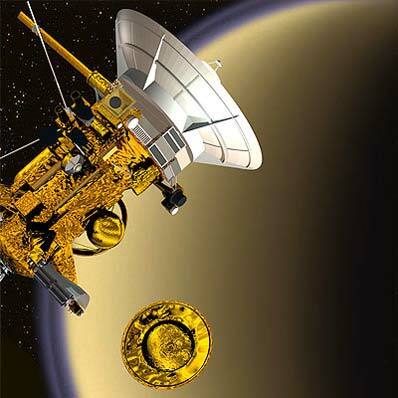 Throughout the descent, data from Huygens' instruments will be transmitted to Cassini, flying past the moon nearly 40,000 miles away, stored on digital recorders and later re-transmitted to Earth. Huygens represents one of the most ambitious space projects ever attempted by the European Space Agency and one that if successful, will reveal a new world to the gaze of eager scientists. "Today's release is another successful milestone in the Cassini-Huygens odyssey," David Southwood, science director for the European Space Agency, said in a statement. "This was an amicable separation after seven years of living together. Our thanks to our partners at NASA for the lift. Each spacecraft will now continue on its own but we expect they'll keep in touch to complete this amazing mission. Now all our hopes and expectations are focused on getting the first in-situ data from a new world we've been dreaming of exploring for decades." The stage was set for the probe's release Dec. 16 when flight controllers at JPL carried out orbital trim maneuver No. 8, an 84.9-second main engine firing that put Cassini - and Huygens - on a collision course with Titan. With Huygens now safely on its way, Cassini's engine will be fired again Dec. 27 to move the mother ship off the current impact trajectory and set up the proper geometry to relay data during the entry probe's descent. A timeline of critical upcoming events is available here. Assuming the 705-pound Huygens doesn't splash down in a hydrocarbon lake, "we have good confidence the probe will survive landing," said Jean-Pierre Lebreton, European Space Agency project scientist. "The landing speed is very low and there is a very good probability the probe will survive landing and we have capability to do measurements for half an hour on the surface. During the three-hour measurement phase, the probe will transmit its data to the overflying orbiter." The original flight plan called for Huygens to enter Titan's atmosphere in late November as Cassini streaked overhead at an altitude of just 746 miles. But engineers were forced to delay Huygens' arrival to January because of an issue with the radio aboard the Cassini mothership that will be used to relay data from Huygens to Earth. During a post-launch test, engineers discovered the radio receiver could not cope with the Doppler shift in the frequency of the signal coming from Huygens due to Cassini's high relative velocity. Much like the pitch of a siren changes as a police car races past a stationary observer, the frequency of radio waves can shift a significant amount if relative velocities are high enough. "Originally, the closing speed of Cassini coming up on Huygens, which is for all practical purposes sitting still once it's in the atmosphere, the closing speed was about 5.8 kilometers per second (13,000 mph)," Mitchell said in a recent interview. "We were coming in almost dead overhead and going off to the right at about 1,200 kilometers (746 miles) altitude." The solution was to minimize the Doppler shift by reducing the relative velocities of the two spacecraft. That was accomplished by changing Cassini's trajectory slightly and delaying Huygens' release to Christmas Eve. During the Jan. 14 descent, Cassini now will be 37,300 miles from Titan and the difference in velocity between the two spacecraft will never be more than 8,500 mph. "We have pretty solid evidence that's going to work," Mitchell said. "We did some tests where we used the Deep Space Network stations transmitting an S-band signal with telemetry modulated onto the carrier so that from the receiver's point of view on the Cassini spacecraft, it should have simulated the probe quite accurately. We adjusted the frequency, taking into account the motion of everything, so that the frequency of the received signal at the receiver should very closely if not exactly match the frequency that the receiver will see coming from Huygens." The tests were successful and a potentially crippling design flaw was resolved with no significant loss of science. And the scientific community can't wait to get that data. Bigger than the planet Mercury, Titan is the only moon in the solar system with a thick atmosphere, one in which hydrocarbons are believed to fall as rain, possibly forming liquid ethane pools on the moon's ultra-cold surface. Cassini flew past Titan in late October, beaming back pictures and radar data that revealed a strange, striated landscape with sharply defined bright and dark regions. Few clouds were present and no large craters were apparent, indicating tectonic, volcanic or depositional processes at work that have resurfaced the moon on a global scale. But there was no clear evidence of lakes or pools of liquid ethane or similar materials that many scientists believe must be present given the moon's ultra-low temperature, high atmospheric pressure and hydrocarbon chemistry. 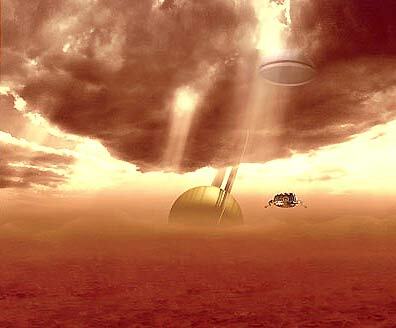 In short, Titan's mysteries withstood Cassini's initial scientific assault. "We've been saying for a long time now that Titan was the largest expanse of unexplored terrain in the solar system," said imaging team leader Carolyn Porco, a leading expert on Saturn's rings. "And what remains hidden under the atmosphere and under the haze, the conditions at its surface, its geological history and so on are, at least in my mind, the solar system's last great mystery."